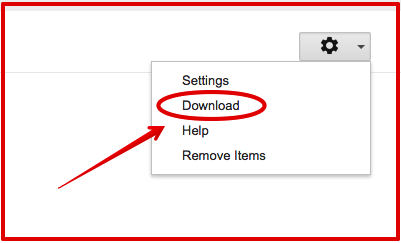 Google has recently added a new feature which allows users to download their search history into a file that is automatically saved on Google Drive. Before, users can only view their search history. Unless you searched for things you don’t want your grandma to see, downloading your search history will enable you to keep a physical archive of all your Google Search activities. Of course this feature works only when you are logged in to your Google account and you have the History feature activated. Do not download your archive on public computers and ensure your archive is always under your control; your archive contains sensitive data. Protect your account and sensitive data with 2-Step Verification; helping keep bad guys out, even if they have your password. If you have decided to take your data elsewhere, please research the data export policies of your destination. Otherwise, if you ever want to leave the service, you may have to leave your data behind. 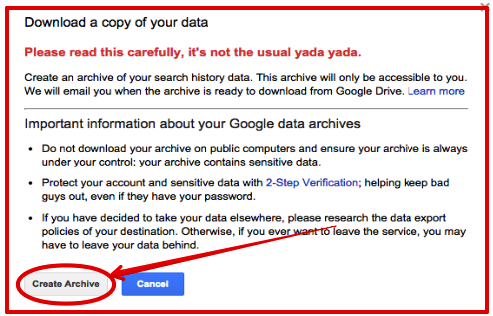 3- Click on "Create Archive"
Once done, you will get a notification in your Gmail with a link to the archived file on Google Drive.